Hero’s Path is a new feature from the Master Trials DLC for Zelda: Breath of the Wild. 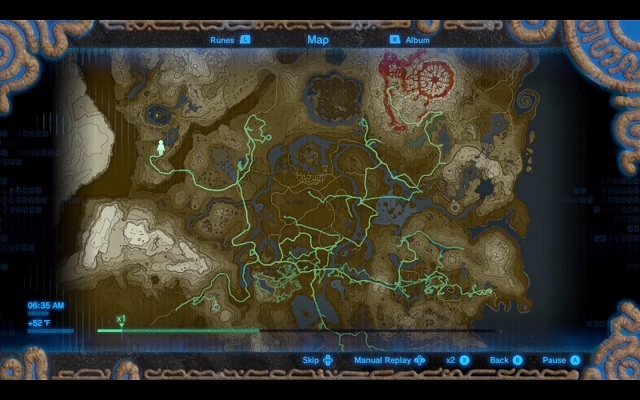 It allows you to see your journey through Hyrule drawn on the map, to help you remember all the places you’ve been. It’s easy to access, but there are a few things that stop it from working properly for some. In this guide, we’re going to show you how to turn on Hero’s Path in Zelda Botw. In order to access the new feature, all you need to do is open the map and press the appropriate button (X). Once you do, a gree line will start drawing your journey across the land. It will also show all the times you’ve died. A bit of salt on the wound never hurt anyone. You can control how fast it happens, zoom in, or move it manually along the timeline. There are several things to keep in mind here. First off, you can’t use it right off the bat – you need to progress through the game a bit first. If you’re using an old save file, you should be OK. If you’re starting over (on Master Mode, for example), it won’t be available for the first few hours, since there’s not much data to go on. Watching a map icon muck about the Great Plateau doesn’t make for a thrilling experience. Secondly, your Hero’s Path may not start at the Great Plateau. This is because the feature only takes into account the last 200 hours of play. If you’ve played longer than that, you won’t get to see the very beginning of your journey.